You’ve already detailed your car, had a garage sale and donated unwanted items to Goodwill. You’ve changed the air filters in your home and dusted behind the refrigerator. So what is a person with nothing to clean have left to do? I mean, besides work all day, make dinner for the family, plan your summer vacation, read books to the kids before bed, catch up the last season of Mad Men before its premiere, and find a more affordable health care plan? How about devote a little much-needed attention to cleaning up your digital stuff? Sarcasm aside, doing a few simple, uncomplicated things to your tech toys will prolong their life, make them run smoother, and save you time when you are looking for files or that photo of junior in the bathtub. Sure, it seems obvious, but when was the last time you actually cleaned your computer, iPad screen, camera viewfinder, cell phone, or TV screen? I for one, can barely see the iPad screen due to the amount of filthy and often Cheeto-ed kid hands that molest it while playing Angry Birds. For any electronic screen, and especially touchscreens, never use window cleaner or other household cleaners. Touchscreens have a coating on them that will get damaged. Instead use a very soft, nonabrasive cloth that is slightly damp or a cleaner specifically designed for touchscreens, like Monster’s iClean. For any electronics, do not spray liquid directly on your screen but rather onto the cloth you’re using, and avoid any openings on the device, like USB ports on your laptop. Use canned air to dust your computer, spraying it on the keyboard and into the inputs to blow out dust. If you are a Howard Hughes type, there are even cell-phone sanitizers, like VIOlight’s VIO700, which uses UV light to get ugly germs off your phone. For general cleaning, we also like CyberClean, a gloopy substance that is safe to use on many electronic devices. Now it’s time to get down to the digital nitty-gritty. If you take your computer in because it’s running slow, one of the first things the smug technicians will do is give you a hard time because of all the digital crap on your desktop. Word Files, Pics, downloaded movies … all this stuff can fester there, slowing you down and making things hard to find. Take a few minutes to organize it and create aliases on your desktop for stuff you access often. Then go in to slash and burn files you don’t need. Get rid of all your kids old reports, downloaded videos that are not sentimental, and so on. (If you are nostalgic and have a hard time letting go, just take this as your yearly opportunity to back it all up. Details below.) Running programs like CCleaner (our favorite), WinUtilities, or Chica PC-Fix scrub your PC, getting rid of useless digital stuff and making your computer more efficient and faster. Mac users have many options to do the same, like iDefrag, MacJanitor, CleanMyMac, and more. How many years’ worth of files do you have on your computer and how often do you reference them? Get all that digital clutter off your hard drive and back it up on a few flash drives, an external hard drive, or both. 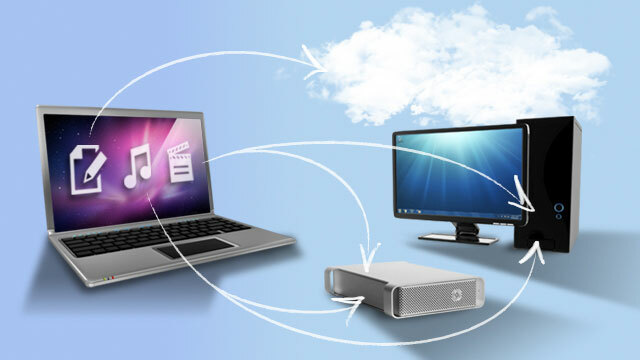 You can also embrace cloud technology to store your files and photos online. We also highly recommend a backup service, which can range from $50 to $100 a year, that will automatically back up your computer for you. CrashPlan, Jungle Disk, KineticD, MiMedia, MozyHome, Norton, SOS—these are all great backup services and most have free trials. Regularly backing up your files should be standard operating procedure. Tombs can be written on how to best manage your photos, especially in this day and age, when film doesn’t limit the amount of pics you can take. One birthday party can produce hundreds of images on its own. Regularly dump your photos off your camera and straight into a photo management program. iPhoto is standard for Mac users and Picasa is popular among Windows users. When you upload them, be specific when naming the event, remembering that events like Fourth of July and birthdays come every year, so years and even days can be helpful when naming your photo events. Like we said above, remove older photos off your computer to external or online storage to free up valuable hard-drive space. How many times has that window come up on your desktop asking you to download all the latest versions of your software? And how many times have you, being in the middle of something uber important, chosen to ignore it? Oftentimes, these software updates are actually useful or important and can even iron out glitches and enhance performance. Go ahead, take the 10 minutes to download and install the software, then restart your computer. This is also a good time to update your operating system if you are using an older version. Take the time now to put your electronics into energy saving mode. For computers, this will automatically power them down when not in use. Many TVs will do the same, and even automatically dim the screen to use less juice in low light environments. You’ll save money and energy going forward.